This is the bike model that started the fat tire bike craze in 1998. They have good traction on rough trails, sand, and snow. Now many brands of fat tire bikes are available. Wonder if it adds extra comfort or extra power to use a bike like that. Pneus bem "gordos", aproveito para desejar uma boa semana. I wonder if they are harder to pedal? I do not think they are any harder to pedal than a regular mountain bike, but rough terrain bikes all take more effort than a road bike. I know Fat Tire as a good beer and I chose a hybrid tire that can go well on trails and bumpy roads. 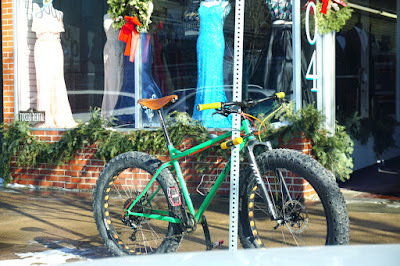 They are very cool though and I love the extreme fat tires you see riding in the snow. I wonder who thought of making fat tires...It's been a while since I've been on a bike and I don't see it in the near future, either!! Thanks for linking to My Corner of the World!